On May 10, it appeared that former Guatemalan strongman Efraín Ríos Montt would spend the rest of his days in a prison cell, convicted of genocide and a lengthy list of war crimes. On May 17, the court released a 718 page sentencing document summarizing the evidence, and providing detailed legal arguments supporting the conviction. For a moment or two, it seemed likely that the largely Mayan victims of Ríos Montt’s savage, murderous abuse would finally receive justice, and that the world would witness the first conviction for genocide ever adjudicated through a national legal system. Now it appears far more likely that the former general will escape into a vast legal labyrinth. 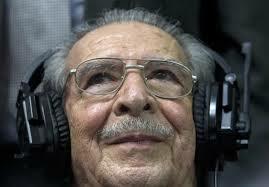 Further, Ríos Montt’s legal team contends that he should be covered under a 1986 amnesty issued by a successor strongman, despite the revocation of that amnesty , and the passage of a National Reconcilaition Law which granted limited amnesty, explicitly excluding genocide, torture and other crimes against humanity, as defined by international law. With a Constitutional Court that appears deeply split and possibly compromised, resolution of these issues, followed by undoubted appeals and challenges to those resolutions, could assure that the labyrinth will provide comfortable cover to Ríos Montt for many years into the future. The truth has been established through brave testimony and meticulous documentation, yet justice remains elusive. Beneath the surface, intimidation, erasure and forced forgetfulness will undoubtedly be deployed against those who dared to speak truth to power; the angel of memory flayed from the walls in the public square.